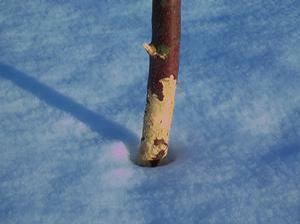 Many critters find fruit trees irresistible in the winter. While we sit inside, warm and snug, God’s critters are outside in the cold looking for something to eat. Last winter at the nursery, the snow got so deep it covered and knocked down the chicken wire fences Grandpa used to protect some nursery stock. Before he knew it, the rabbits were chewing on the tender, tasty bark of many of his young containerized fruit trees and even some of the rootstocks budded for the year’s crop of bare root trees. It doesn’t take more than a few critter chews to ruin a tree! Tree wraps alone would have saved the day. Grandpa provides them with every tree for a reason. Spiral guards help protect the young trunk from winter damage as well as some critter control. They are very easy to put on and should be used shortly after planting. It is often advisable to bury the bottom end an inch or two into the soil so that it protects from mice and moles that may burrow just under the surface. Sometimes a new shoot will grow between the spirals, so periodically check and remove those shoots. In a couple years when the tree is filling out the wrap, it can be removed. If you are concerned about further damage in later years, then you can replace the spiral wrap with a larger piece of corrugated plastic pipe, just split it up the side to apply it to the trunk. However, after a few years, the bark of the tree is usually thick enough and not as tasty to chewing rabbits and mice. Spray on deer deterrents periodically; they really work well. Tie small bars of soap in the tree branches, even though some other critters may eat it because of the fat content. Pin or staple really fragrant fabric softener sheets to the tree. The “human-like” smell deters the deer. Be sure to replace them after a couple weeks; exposure to the weather will weaken the smell. Scare crows hanging from ropes or chains have been used with pretty good success by Grandpa. This is pretty effective if they are twisting and swaying in the wind. The key is to fool the deer into thinking that people are around and then they are too afraid to go near your trees. If you have a dog, set him loose at night and maybe he can earn his keep! However, I have heard that over time the deer just start to ignore the dogs too. Growers have told Grandpa that they have found damage as high as half way up apple trees in places where the snow has drifted. Caging individual trees with at least 6 foot tall wire cages made from woven fencing can be really effective when dealing with a small number of trees. Make sure the cage is about 3 foot in diameter. Secure it and support it with a couple of poles so that the deer can’t move it, in hopes of nibbling on tender shoots. After a couple of years it can be removed. Be sure to check your fruit trees often for damage. The first time you lose some of your best trees to critter damage during the winter, you will tend to remember this hard earned lesson and take better care in the winter season. I have had big vole troubles the first 3 years of orcharding. The very beginning of last winter I had a tree that the bottom foot of bark was completely eaten away. I have guards but in this case, the vole had tunneled underground and then up inside the guard. In an effort to save all the other trees (90), I dumped 203 inches of gravel inside the guard. If the voles try to tunnel again, they may be frustrated with all the rocks fallen on their heads. NO more damage last winter except that first tree, and none so far this year. 15 or more lost in one season before the new rock trick. This won’t help against pine voles or root damage but it seems like an easy fix.